Rare Apollo 11 Robbins medal, serial number 179. 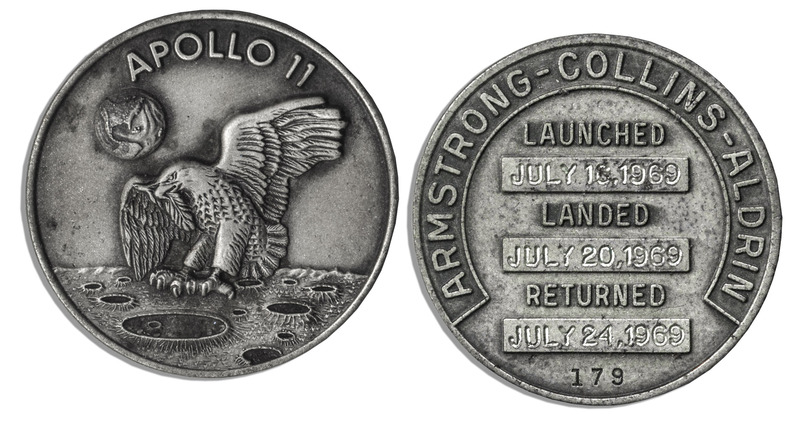 Front of coin has “Apollo 11” engraved above the mission insignia of an eagle landing on the moon’s surface carrying an olive branch. Verso has three dates for the launch, “July 16, 1969”, landing, “July 20, 1969”, and returned, “July 24, 1969”. 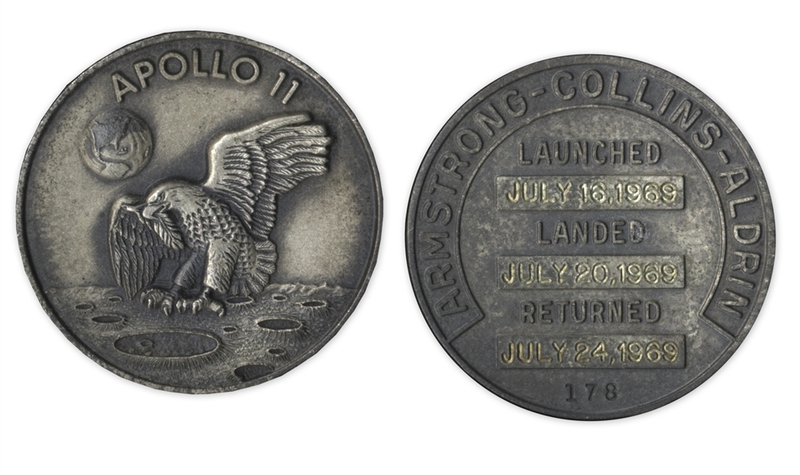 For the moon landing missions, three blank fields were included for the launch, lunar landing, and return dates and later engraved, as is the case here. Verso also has the “179” serial number engraved with each astronaut’s last name. Coin measures 1.25” and is made of sterling silver, housed in its original ”Robbins Company” plastic box with an “149” sticker on the bottom. One of the most expensive prices obtained for an Apollo 11 Robbins medal. Fine. With an LOA from Apollo 13 astronaut Jack Swigert’s sister. Sold for $42,000. Rare Apollo 11 Robbins medal, serial number 217. 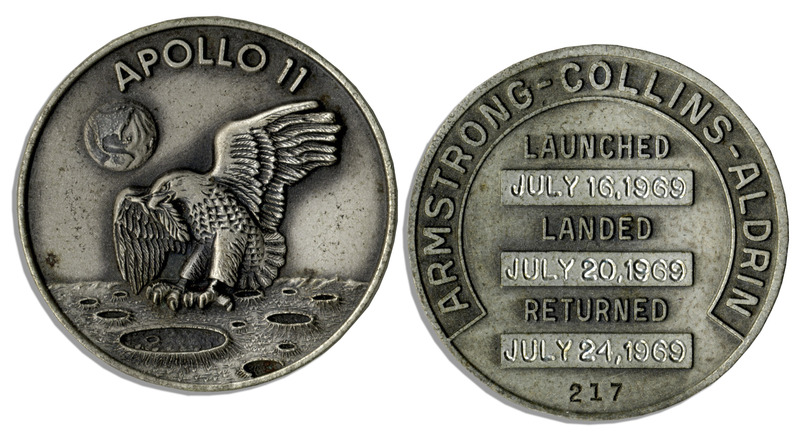 Front of coin has ”Apollo 11” engraved above the mission insignia of an eagle landing on the moon’s surface carrying an olive branch. Verso has three dates for the launch, ”July 16, 1969”, landing, ”July 20, 1969”, and return, ”July 24, 1969”. For the moon landing missions, three blank fields were included for the launch, lunar landing, and return dates and later engraved, as is the case here. Verso also has the ”217” serial number engraved with each astronaut’s last name. Coin measures 1” and is made of sterling silver, housed in its original ”Robbins Company” plastic box with an ”217” sticker on the bottom. Fine. With an LOA from Apollo 13 astronaut Jack Swigert’s sister. Sold for $34,375. Robbins medal flown aboard Apollo 11, the mission that first put humans on the moon on 20 July 1969. Coin includes mission name and depicts the mission insignia of an eagle landing on the moon’s surface carrying an olive branch. Verso has three dates for the launch, ”July 16, 1969”, landing, ”July 20, 1969” and return, ”July 24, 1969”. Verso also has each astronaut’s last name and the ”178” serial number engraved. Coin measures 1”, made of sterling silver and housed in its original ”Robbins Company” plastic box with serial number sticker on the bottom. Condition on this Apollo 11 Robbins medal is a little worse than the first two mentioned above. From the Jack Swigert estate and with an LOA from his sister. Sold for $25,000. To auction, buy, consign or sell an Apollo 11 Robbins Medal, please contact Nate@NateDSanders.com or call (310) 440-2982.